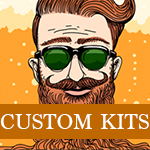 The simplest way of making beer from kits can sometimes be unnecessarily disappointing, at Geterbrewed we value our customers and we want them to brew successfully and be impressed with their batches of homebrew. Too many suppliers are selling beer kits that aren't suitable and they don't give support to help people brew successfully, it isn't like homebrewing in the 70's you can now make really impressive batches of beer at home with ease that can easily surpass the quality of shop bought beer at a fraction of the price. So if you wanted to try making a true to style NEIPA at home you now can plus we even have a Beer Kit with the latest advances in hop technology, the first Cryohop beer kit. Homebrewing isn’t just about saving money and being frugal, its now possible to brew your own beer, cider and wine at home that is better than shop bought at a fraction of the price. 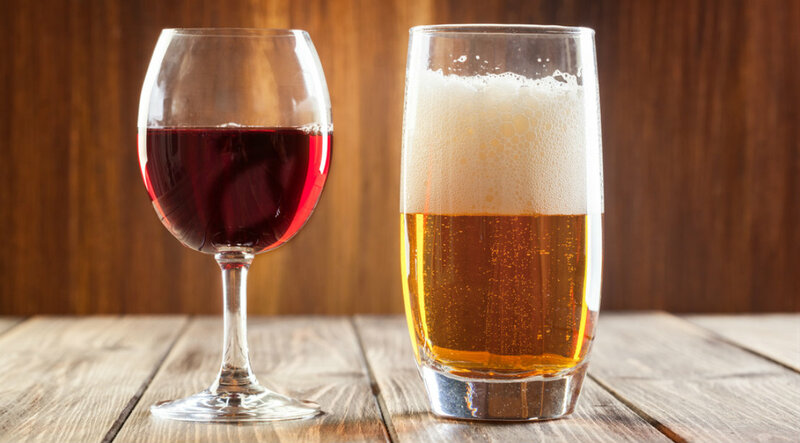 Some people choose to make their own beer, cider or wine because they know whats going into it, many commercially brewed alcoholic products have many chemicals and additives, when you brew at home you have control of the contents. Personally I find brewing therapeutic and starting to brew your own isn’t as expensive as you would think. Giving out homebrew gifts is an amazing way to add a personal touch to a gift, we have brewed wine for our friends’ weddings, we have made wine to give out at Christmas for gifts and we regularly share our beer brewing experiments with friends for constructive feedback. Brewing can be as simple or complicated as you want to make it, we have brewing equipment for all budgets and levels of experience and we have the in house knowledge to help you brew successfully and consistently what I’m saying is anyone can homebrew, need help then please reach out, we love to help folk brew, it’s what we are passionate about, we started a homebrew revolution 5 years ago and we take great pride in helping you to brew exciting beers, ciders and wines. A top quality home brewed beer, cider or wine will bring a smile to your face and make you very proud you created it! So What is Craft Beer Rising? We arrived into Brick Lane via our Uber taxi and immediately the atmosphere was buzzing from when we stepped out of the cab, I like the hussle and bustle of the East End of London, it's vibrant and we soon spotted the queue to get in and so we jumped straight in, we had discussed having a coffee first but like a bunch of excited school kids we joined the queue. I thought what a nice mix of people waiting to get in, all age groups, all nationalities and one common factor bringing them together...... craft beer and some pretty awesome beers at that. So wrist band on, catalogue in hand and a glass at the ready, we started to climb the steps, I felt like I was walking into a rave, super excited and loving the beats blasting out, as I entered the main beer hall I was immediately impressed to see a much better layout that previous years, more space and a more delicate lighting set up, it had a warm feeling. We decided to have a walk through before making any beer choices, well we made it a short walk and soon found some suitable beers to kick the night off. The Plan....well we wanted to enjoy the festival and our weekend in London so we decided to stay with the sessionable abv beers to begin and then try the big hitters before going home. With 175 breweries in attendance it was an incredible offering of beers, clearly we couldn't sample them all but we each had a few 'bucketlist beers' we wanted to try, I can honestly say I didn't have a bad beer all night, I got my mind blown with a few beers and genuinely was inspired by some of the beers I tried. I went through some amazing NEIPA's and alot of Sour beers too, there was also a decent selection of cider, some spirits and wine too. It was great to see some of our own Irish breweries there representing, we had Bru, Wicklow Wolf & the Porterhouse and we received their welcoming hospitality with a friendly face and a good chat. Krafty Kuts played the best set on Friday in my opinion, I'm past the shape shifting dancing stage of my life now but it lifted the mood and I watched some hilarious Dad dancing which really made my night. We smiled, we chatted we laughed and actually got to sit at a table as a group and have an amazing experience, we really enjoyed the music and feel this is a top notch fest that we will be sure to return too. Well done guys for arranging a great event and thanks to the brewers we chatted with you made it an amazing experience for our team. Geterbrewed have been supplying hops to breweries for a few years now and we have found the attitude towards hop contracts worrying at times, don't get me wrong the large proportion of our brewers manage their hop contracts well, but some are reck-less and don't consider the impact this might have on our business if they get the quantities wrong. Geterbrewed are proud to say they have never let anyone down on a hop contract, if you contract hops with us we make sure the availability is there. Some hop merchants regularly don't fulfil hop contracts and then you see some brewers thinking this is the norm so they over contract and you can see the problems this may bring. 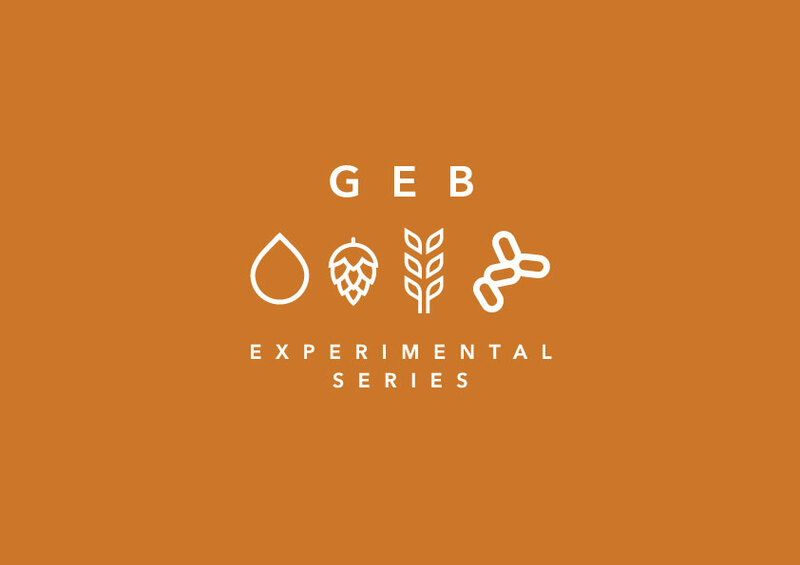 Geterbrewed is a hop merchant plus we are a small family run business, we work closely with our hop merchants and hop farmers, we have to honour our contracts so when someone contracts recklessly it has a huge impact. If you don't know how to plan your hop usage then don't guess! If you need more hops throughout the year we can usually source them so its better to be contracting a safe amount. Geterbrewed Cold Store their hops and if a package needs broken down into a small amount they are nitrogen flushed and foil vac packed to preserve freshness, we allow brewers to draw off their contract as they need it but we do ask for good communication so we can ensure we manage our stock levels correctly. A Hop Contract is a serious agreement that can be challenged legally and you need to be taking it seriously. We've had a few people walk away from hop contracts and others let us down with volumes but we have to pay our contracts so be prepared to be challenged legally if you get it wrong! What is a Hop Contract? Why Should I Hop Contract? How do I get a Hop Contract? What volume of Hops do I need to Contract? Geterbrewed cover all sizes of hop contracts, from brewpubs wants to secure small sought after varieties to some of the largest breweries in Ireland. How far in advance should I contract hops? In summary the hop industry is serious business we have farmers, their workers and a whole chain of people that rely on an income, plans need to be concrete and the contracts need to honoured. Be responsible! You must have lived under a rock if you’ve followed homebrew over the last few years and haven’t come across the Grainfather! If somehow you’ve not seen this before, the Grainfather is the All-in-one brewing system. 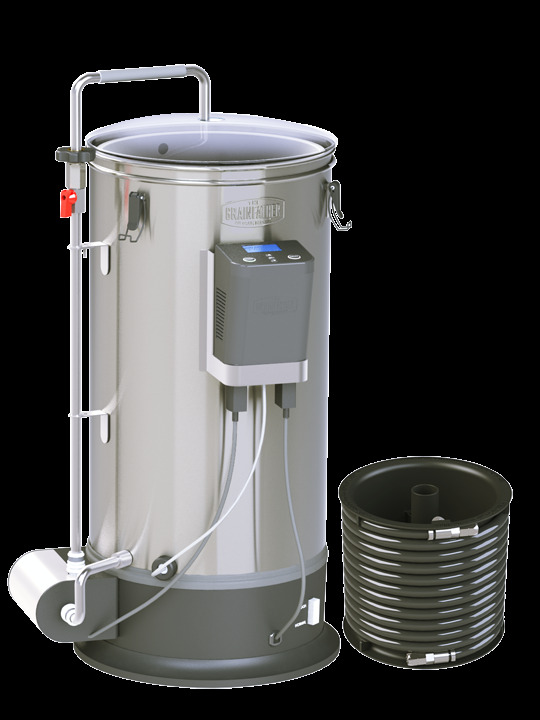 You can mash, sparge and boil in a single vessel and they even include a super-efficient counter-flow chiller – not enough? The even have free recipe software and a Bluetooth enabled control box so you can plan your brewday and then control it from your phone. Why an All-in-one Brewing System? The biggest advantages of having an all-in-one system are things like space saving, time saving, more control, less to clean and the ease of using in doors. The Grainfather is an electric, pump driven system which allows you to have a recirculating mash whilst maintaining the heat perfectly. 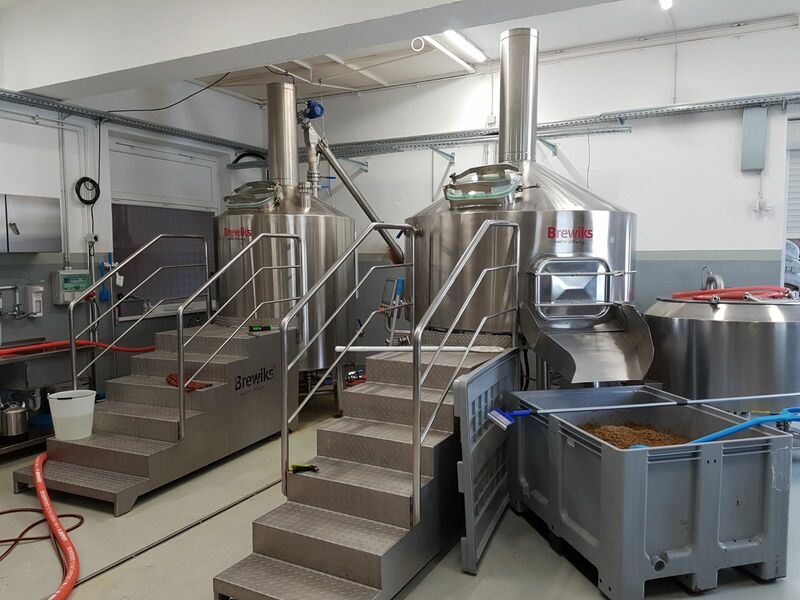 This helps get the most out of your malt and is so easily repeatable – imagine making the best beer ever and being able to make it again and again! If you want the same level of control from a three-vessel system, you would probably need herms pots, insulated mash tuns, countless valves, elements and it would probably cost a hell of a lot more when you add it all up. The Grainfather takes away none of the fun – sure it helps control a few things, but you’re still creating your exact recipe, still mashing in, sparging, throwing in the hops etc… it’s proper brewing and I doubt you’d find a single user that disagrees with this. It also pretty much cleans itself – just rinse out after use, heat some water, put everything you used back in. Then throw in their High-Performance cleaner, connect the chiller and switch the pump on. You can expect to be finished and tidied away within 4-5 hours without rushing or stressing at all. All of the fun, less of the mess. There’s other all in ones on the market that cater for different budgets. Some benefits the Grainfather offers include the most advanced, user friendly controller on the market, along with the software to go with it. It makes use of a PID algorithm, so where as other systems power is either on or off, the Grainfather reduces power sent to the element as it approaches the desired temperature, so it doesn’t overshoot. It then regulates the elements to accurately keep it stable. You can reduce the vigour of the boil if you want to and even change what the system recognises as your boil temperature (handy for those who live high up). An added bonus for me is the ability to tell the controller when to switch on the heat. I often brew first thing in the morning so set up the night before and wake up to my strike water heated, ready to mash in. It saves time and allows me to be finished and tidied away well before lunch. The chiller is a real step up from the standard immersion coils – you pump your wort straight into the fermenter via the counter flow chiller (essentially a heat exchanger), running cold water through the other fittings. It remarkably chills from boiling to room temperature on its journey through and you can pitch your yeast straight away when the wort is all in your fermenter. Depending how cold your ground water is, it can chill a 23l batch in as little as 10 minutes. The build quality is excellent compared to some budget systems and the modular design allows you to upgrade your brewery when something that interests you comes along. They don’t leave customers behind – for example, the recent change from a manual control box to the Bluetooth connect box mentioned above is available for users with older models. The customer service is also really important to the folks at Grainfather. They have guys in the UK as well as New Zealand and any issues are dealt with quickly and efficiently – the warranty is 2 years for your peace of mind. We know guys that have clocked up well over 300 brews in the two and a half years on the market and still going strong – that would be a life times use for many of us! I could go on all day about the Grainfather, but a lot of it’s already been said elsewhere. The countless user videos on youtube, the blogs, forum posts and chatter on social media are overwhelmingly positive which is a real testament to the guys at Grainfather. It’s been designed by brewers for brewers and it really tells! So I landed in a snow dusted airport in Slovenia to a cool minus 13, I'm brewing on the new Brewiks 1000 in Maiester Brewery and I'm getting a lift from the airport by Damir the owner of the Brewiks brand. So after we mashed in it gave me the opportunity to discuss with the brewers what it was like to upscale from the Brewiks 500 litre system to the new Brewiks 1000, right off the mark he said it's easier and the best bit is the mashing and lautering works better. He talked about a better clarity of wort, I explained that we had added an underback to the Brewiks 500 system that we had and it made the clarity much better. The head brewer explained generally all the brewers felt it made alot of improvements and was easier to use, the only negative they said was the hop revolver it allowed direct steam to release when opened but they had already found a work around and added via the glass lid. I noted the guys had added a hop filter between the pump and the heat exchanger and they said it was an added extra that the Brewiks team made to prevent the heat exchanger getting blocked with hop debris . They also explained that initially the heat exchanger was a little too effective and they had to slow the pump speed but now they have found a workaround, they changed the cold water flow hose diameter to 25mm from the hose lock tubing and add a ball lock valve to allow them to control the flow, so the pump speed is set to 80% and the flow restricted using the ball valve and it chills a 1400 litre batch with ease. The turnaround time from the first batch to the second batch was 30 minutes and the hot water generated from cooling the first batch was used to mash in with the second batch, an impressive 5 hour brew time for the first batch also, so I started to try and find problems as so far it seemed to good to be true, so wanting to give an impartial review I found an issue , it needs a light in the inside of the boil tank and lauter tun. I was slumming it with a torch and although I'm scraping the barrel to find an issue it was one. The touchscreen brewing technology with live time diagnostics including all temperatures and live power usage rates may seem intimidated but it was very simple to operate , i have to admit it did seem too simple to me and I kept thinking I had missed something but it genuinely makes it simple to operate. The pump speed can be changed at the touch of the button as with the smaller models and the stepped platforms make over seeing the brew insanely simple. As the first brew of the day completed I enjoyed some pizza delivered to the brewery and a pint of IPA straight from the fermenter, Slovenian hospitality is always awesome . During the second mash in for the 2nd brew of the day I noticed the mash temperature drop as the malt was augered in , I got the boiling button and the temperatire shot back up rapidly, I flicked it to reservoir heating one degree out and it stopped bang on target mash temperature. A simple moving of hoses and I'm connected up for transfer to the lauter tun. The brewiks boost heating system is a beast of a machine it heats 1 degree in one minute. So when we transferred to the lauter tun, lautering took half an hour, yep I couldn't believe it either, so visually it has been manufactured robustly to allow for vacumm layering but that was designed for an hour and half of lautering yet it didn't need it. The system brought the wort to a vigorous rolling boil and the steam was maintained with the condenser and adding the hops was simple, we whirlpooled and the brewers explained that after whirlpool they let it settle for 10 minutes before they commence the transfer from the kettle to the heat exchanger, the key here is to avoid excess bitterness in your brew is to simply have all your pipes connected prior to commencing the transfer. Effiency was 95% and when I challenged that with the brewing team they said a bad efficiency rating would be 90%. This system is built to last it oozes simplicity and works effectively and efficiently I was impressed!! So if a light gets added to the next model and wheels to the steps for ease of cleaning this has to be the best system on the market for anyone considering a 10hl or 20 hl brewhouse. "Kegging is King" especially if you bring a keg to a party, we like to have friends around for beer and pizza nights and a keg is great means to excite people with your brews, plus you can have beer ready a lot quicker in comparison to bottle conditioning and........................... its a lot less hassle than bottling! 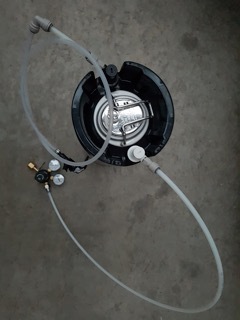 What are the Fittings on the Corny Keg? Basically there is two ports on a Corny Keg, Beer Out and Gas In. 1. Beer Out, you attach a ball lock disconnect to this and it has a beer dispensing assembly connected to it, whether that be a tap directly added to the ball lock or if its run out into a length of beer line and then into a picnic tap or tower dispenser. The key point here is to avoid foam (fobbing), a lot of turbulance is created as beer exits the keg under pressure via the ball lock valve so you want sufficient beer line length to prevent this coming out of the tap, it needs to settle in a length of beer line . Also the beer needs to be cold, the warmer the beer gets the more the co2 wants to come out of suspension and foam up. What is the Dispensing Tap Assembly? 1. What is it like being a hop farmer and what made you get into hop farming? 2. Does the region that you live in produce a different quality hop to other regions within Slovenia? Due to Climate change the growing region has started to become more and more important, we are blessed with our location and we can grow some beautifully impressive hop varieities as do our friends and colleagues. We work very closely with a collective of farmers in our area, we are constantly striving to bring better results.There isn't any set scientific stats to suggest that the hops in this region are better than other parts of Slovenia but when you look at the hop analysis and you see alpha acids and oil contents at a 20% higher rate comparing to other regions then we are thankful for our location. There is alot of factors that impact each individual region, for example daily maximum temperatures during maturation of the crop, pest and disease management and harvesting at the correct time and following a low temperature drying base. 3. Many Irish and UK brewers regard Slovenian Hops as being used purely for bittering, what have been the recent developments been in flavouring and aroma hops? I wouldn't say that we have been regarded as good in bittering hops ever? It is perhaps a misconception and I would like to see that opinion change. We don't have high alpha acid varieties in our portfolio of hops. Historically some German Magnum hop plants were used to breed Slovenian Dana which has roughly the same alpha acid range. Slovenian Hops have a strong reputation for Aroma and Noble aroma hops. Varieties like Aurora, Styrian Golding, Bobek and Savinjski Golding are dominated in our fields. Since the worldwide explosive interest in Craft Beer the Slovenian Hop Institute has tried to breed varieties that are more attractive for the Craftbeer sector. You will see an example of this research already in the marketplace with the variety "Wolf", it is also perfectly rounded bitterness with high alpha acids for bittering. Checkout the new varieties Styrian Cardinal, Styrian Dragon and Styrian Fox. 4. What way does the year get broken down in terms of hop farming? Our hop farming schedule is from middle of March til November. The ground works required during Spring come with high labour costs. We need to clean the fields from wooden parts of the zhizomes, stringing of new wires. The Twining of the hops takes place during May/June. During the peak growing season we try to keep the fields clear of weeds, in doing this we are not using any chemicals or the popular choice elsewhere to use Glyphosate preparators. We focus on proper mechanical processes instead of chemicals. During the July/August period we are checking constantly to manage diseases, we are fighting against all kinds of mites and moulds, to provide a healthy crop on occasion we do have to use some agricultural products to keep the plants healthy to produce cones full of aroma. Infected hop cones have many disadvantages or bad smells in your beers if this isn't cared for. At the end of August we commence the harvest, this is when we work the longest hours. There is a wealth of information and scientific papers of when to commence the hop harvest but in reality we rely on our pinch of instinct and lifetime experiences. The most crucial part in the harvesting window is hop drying...Never more than 58 degrees celcius and it has to be carried out as quickly as possible. We ensure that a huge amount of hot air is blowing through a few layers of hops. There is an old proverb "The more you can smell around the barn the more you lose at the end"
After the drying process in the kiln we re moisten the hops which keeps the product stable while we pack them. 5. Hop Farming is one of the most difficult choices to make in farming, do you focus solely on hops or do you farm anything else? We are 100% focused on hop farming. Since we don't strive to own anymore property or land we try to maximise the output from our current fields, this isn't an easy task but it is enough, at the end of the day we reach the point where all the work is still a joy and a pleasure. 6. What size is your hop farm? 7. How long does it take to grow hops? After we put the rhizomes into the soil it takes up to three years until they reach full maturity, this changes depending on the variety you grow but usually its a 3 year average. 8. Is it difficult to grow hops? What are the challenges? It depends, if you have a goal and see yourself in a ten year timeframe, taking into consideration what you want to be and what you want to bring to the market, then its a really rewarding and nice job. We feel the proudest when our customers give us proper feedback. Sometimes it isn't always positive, buy hey, that gives us a new goal, to improve ourselves. 9. How long can you keep hops? 10. How do you recommend hops are stored? 11. What is you preference for brewers to use, pellets or leaf? 12. Have you ever smoked a hop? 13. What is your favourite hop variety? 14. What predictions do you have for the future of hop farming? Like I already mentioned before the weather is becoming a huge factor but there is lots of other issues we are facing. 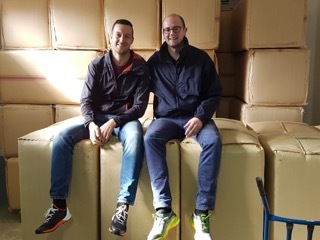 Labour costs are going up and we want to have happy people working for us in our fields, at the end of the day they bring in the crop, their impact is huge on the finished hop product. In the other hand, the civilised society look down on hop farming as an ugly industry but overall we are one of the most precise and advanced branches in agriculture. We don't do anything from our own instincts, every little thing is planned, forecast and trackable, we want to protect our environment like it is for the future generations. "The main players in shaping the hop industry are the you the brewers. I'm asking you to take a look at what you are doing with the craft brewing industry, all of you are talking about the famous C varieties, I challenge you to try something old, something traditional, expand your portfolio and don't be afraid to look for something new. We are here for you, striving to grow only the finest quality hops and predict your needs accurately be realistic. Regardless of the crop the brewing business should be solid and stable through the whole chain." Now it used to be thought that only cheap wines had a screw top enclosure and that fine wines needs a cork to allow the wine to receive a very small amount of oxygen to smooth out the tannins. Benefits of using a Screw top Wine Bottle? At the end of the day fine whiskeys costing hundreds of pounds use a screw top and that isn't an issue so why would using a screwtop on a wine bottle seem cheap? The hurl maker is also a passionate home brewer so he knows these have to be a strong product, we have made a few different versions of these but have now settled on using Irish Ash Wood for the mash paddles. Michael the Hurl makers has taken over from his father who started the business in 1979, they are part of the Economusse network which our brewery is also apart of and we work closely together attracting tourists to our working museums, a great visitor experience if you are ever in their area, they do a live hurl making demonstration. 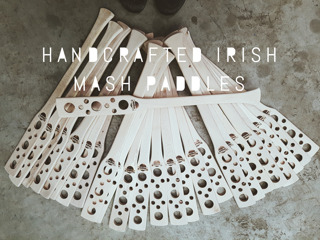 These mash paddles are genuinely excellent value and usually sell out quicker than Michael can make them.